High Output Marine Alternators by ZENA, Inc.
High output marine alternators so powerful that you can weld with them! The ZENA® mobile welding system is a new technology, self-contained, ultra-compact, commercial duty, engine-driven DC welder which can be attached to any engine. This welding system uses a unique, modular, electrically isolated DC welding power generator, which is built by ZENA, Incorporated, in the USA, to withstand the extraordinary stresses of high current welding in severe operating environments. ZENA alternators/power generators are designed for external regulation -- and are designed to be completely compatible with ALL types and brands of heavy duty (8-10A rotor current) external voltage regulators! This means that you can take advantage of a wide range of alternator control systems ranging from simple, automotive voltage regulators to the most sophisticated multistage and/or programmable voltage regulator units/systems on the market -- including the line of highly specialized and sophisticated regulators that we have designed to take maximum advantage of all of the capabilities and features built into our ZENA power generators! And, it also means that you can probably replace your existing alternator with a ZENA unit without the expense of replacing your existing external regulator! Need very high charging current? ZENA power generators/alternators are also designed to work as secondary alternators dedicated to charging a large secondary battery bank -- or supplying power for other nonstandard electrical loads. Used in this way, your engine starting battery and stock alternator can be left in place -- operating as they were designed to do -- insuring the integrity of key operating/safety systems. Need even more power / charging current? Thanks to unique construction features and our unique electronic control system, multiple power generating units/alternators can be attached to the same engine, or multiple engines -- controlled and used together -- just as if the individual generators were a single giant alternator! Specifically designed for use in this manner, with the appropriate control accessories, ZENA's modular power generators/alternators can be used in synchronized groups to efficiently produce very high, well regulated battery charging currents -- from 150 to over 1,200 amps., in 12 volt systems -- and over 750 amps in 24 volt applications! The use of multiple generators on a given engine, strategically mounted (for example on opposite sides of an engine) can also serve to remove side loading stress from engine bearings while still allowing the installation of a large charging system. larger charging systems can easily be configured! The typical alternator is just not built like a ZENA DC power generator (a key reason why we make this distinction rather than referring to them simply as alternators). Therefore, if quickly charging batteries is important, a ZENA power generator is an ideal solution. Unlike standard high-amp alternators most of which are designed to produce high currents for a relatively brief period, a ZENA power generator/alternator has been built to produce higher currents continuously --- an absolute necessity for welding, and also a great feature for big charging jobs. ZENA power generators are designed so that they can be controlled with either A or B Circuit (type N or type P) external voltage regulators, or with ZENA's model WC.VR voltage regulator and WC.12 or WC.24 multi-generator controls. Ultra heavy duty output terminals are fabricated from silicon bronze (almost pure copper, but more durable) to insure minimal corrosion in marine environments as well as minimal electrical resistance to the huge charging currents that ZENA power generators can produce (many alternators use high resistance, easily corroded, mild steel terminals on their alternators). AND, these oversize bronze terminals are no less than 5/16" in diameter at any point -- capable of easily handling much larger charging currents -- unlike many so-called high-amp/heavy-duty alternators which only appear to have heavy duty output terminals while internal current handling components are actually far smaller. Generator/alternator output is completely isolated electrically from the generator/alternator case (and, therefore, from the vessel's ground plane). When connected to take advantage of this feature, high amp alternator charging currents can flow directly to the batteries WITHOUT having to also pass through hull or fittings. This feature also makes connection of generators in series parallel combinations possible. Generator/alternator field circuits are also completely isolated electrically from the generator/alternator case (and, therefore, from the vessel's ground plane) enabling special regulation systems to be implemented without modification. Rectifiers in all ZENA power generators/alternators are more than double the size required to handle rated output currents, and are also capable of handling exceptionally high reverse voltage spikes. Rectifier heat sinks are equally robust allowing reliable high amp operation in exceptionally hot operating environments. For example, in our SR200 series, which is designed for exceptionally duty, we use twelve (12) individual rectifiers (double the amount found in a typical alternator) -- mounted on double solid copper heat sinks in a separate cooling compartment isolated from the hot internal generating components. 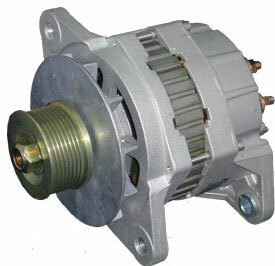 (This provides most of the benefits found in an externally rectified alternator without requiring extra engine compartment mounting space or requiring a more complicated installation or extra wiring. Bearings are oversize, and much higher quality than found in a typical alternator -- equally capable of handling high side loads and high temperature operating environments. 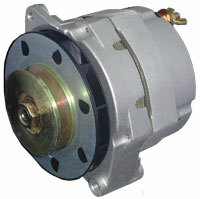 For example, our 200A alternator's front bearing is large enough for use as a wheel bearing on a small utility trailer! To further reduce bearing wear, and increase service life, rotors are spin balanced and machined to ultra close internal tolerances. Internal wiring, including stator and rotor windings is extra heavy duty -- oversize (stator wire is so large in diameter that windings must be carefully hand fitted to stator laminations), and designed with an insulating system capable of withstanding temperatures of more than 150 degrees Celsius (over 298 degrees Fahrenheit) without failure. All magnetic materials (stator laminations and rotor poles) are built from alloys specially selected for superior magnetic properties. These features do not, however, repeal any laws of physics, nor do they eliminate the necessity to follow good charging system design parameters. You should not scrimp on the selection of proper voltage regulation and/or system protection components for a given application -- nor should you ignore over temperature protection, manufacturer's recommendations for charging current/voltage, proper fusing, charge current limiting/monitoring during bulk charge, etc. These considerations are especially important if your are planing to charge a large battery bank (particularly a large AGM battery bank -- or battery banks made up of a more than three individual batteries wired in parallel) with a relatively small generating system. Such a system would be defined as one where battery capacity in amp-hours (AH) is more than twice the continuous charging capacity of a given alternator in amps. An example of this would be a 200A alternator being used to charge an 800AH battery bank. ZENA power generators are sold with a three year limited warranty which does not exclude commercial or marine use. And, our guaranteed overhaul / rebuilding cost policy further insures your investment. Just try to find a high output alternator anywhere with a warranty -- and/or an overhaul/rebuilding policy like this!